The holidays are an ideal time to share a little bit of what we have with those who have very little. 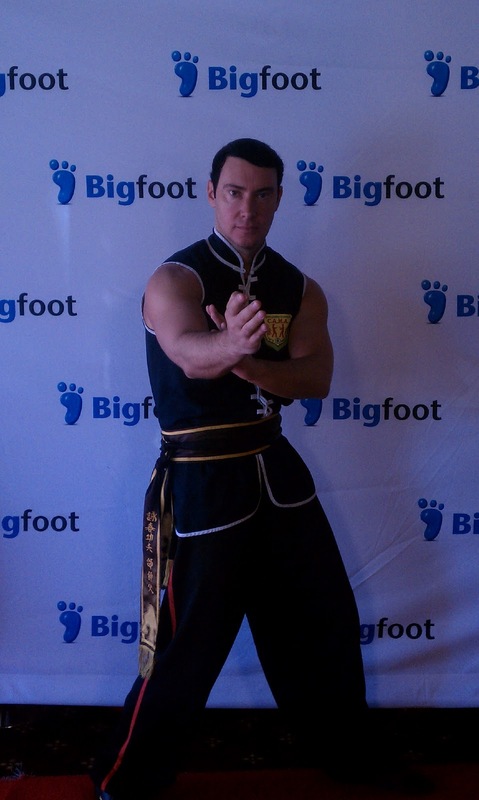 For the week, The Giving Jar will be here at our martial arts school. So far, we have raised about $66.00 in 5 days. It is especially important that we teach children the importance of charity. Many of them will receive dozens of gifts this season from friends and family, not realizing that some kids – maybe even some of their own friends at school – are so much less fortunate than they are. A gift for a teenage girl whose parents can't afford to buy her one. Pantry supplies for the BTAC center. We recently read that the center is low on supplies in a Burbank Leader article. Our Kung Fu kids will have the opportunity to go shopping with Instructors for the pantry supplies at our local Albertsons market. They will be given budgets and shopping lists and challenged to make all of their purchases with just the donations from The Giving Jar. Thank you to all who have donated, and Happy Holidays! 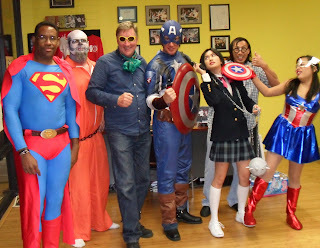 Here at California Academy of Martial Arts our Memorial Day Weekend could not have been busier. 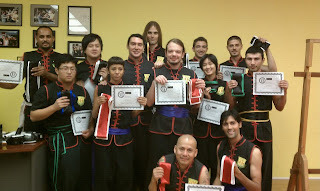 The madness started on Saturday when our Kung Fu Los Angeles Demo Team performed at Raging Waters San Dimas. The event was a Kung Fu Panda 2 Party complete with free T-shirts, Silly Bandz, beach balls, and of course, our performance. The event was one of our longest and most successful demonstrations ever. We debuted two new acts (a History of Kung Fu and Wing Chun skit and a huge 7-person fight scene) as well as performing old favorites such as Siu Lim Tao and Ping Kuen. What happened after the demo was over was just as memorable - our entire team was treated to a day at the park. Everyone came away thrilled, relaxed, happy, and in a few cases, a little sunburnt. Kung Fu Panda 2 Party at Raging Waters San Dimas! Big news! Our Kung Fu Los Angeles Demo Team will be performing at Raging Waters San Dimas this Saturday, May 28th, at 12 pm sharp. We'll be near the Flowrider, adjacent to Splash Cove. P.S. After our performance, our team and guests will be enjoying the park. Say hi if you see us. Check out this advertisement from Hong Kong Airlines advertising that they teach all stewardesses Wing Chun. 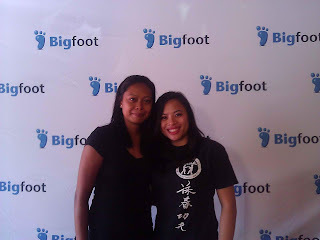 We blogged about this recently in our post Wing Chun Training for Women... in Midair! On Thursday, May 26th, "Kung Fu Panda 2" (the sequel to the 2008 blockbuster) will hit theaters. 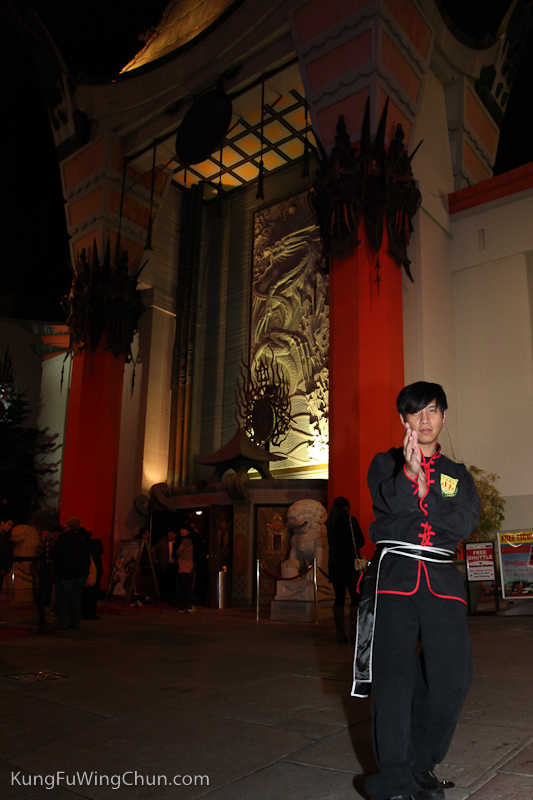 California Academy of Martial Arts' Demo Team plans to demonstrate outside the Burbank AMC 16, one of the best-attended movie theaters in the country according to this Burbank Leader article. Keep an eye out for us! In 2008, the original "Kung Fu Panda" inspired countless kids to take up the ancient art of kung fu. Its message was that self-belief, coupled with hard work, can transform even the laziest Panda into a formidable warrior! The sequel, according to news reports, has a theme of self-discovery: Po, discovering he is adopted, sets out to learn about his birth family. Memorial Day is an official school holiday for our kids, and the unofficial start of summer for all. Get your child's summer off to the right start by sending them to our MEMORIAL DAY CAMP on Monday, May 30th from 9 am - 3 pm. 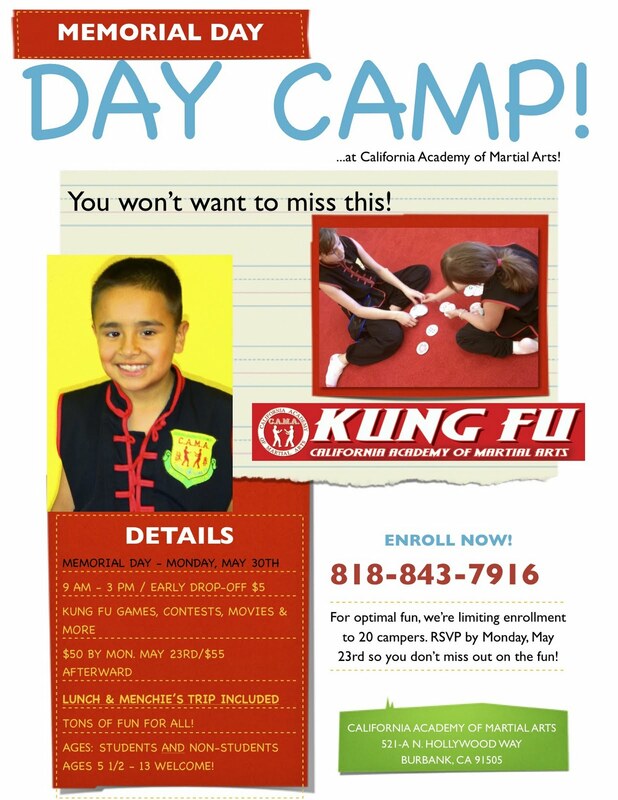 We're playing kung fu games, drills, life skills training, watching martial arts movies, and just having fun all day long. The cost of the camp is $50 and includes lunch and a trip to Menchie's. To RSVP - and do it soon because space is limited to 20 campers - call us at 818-843-7916 or e-mail info@kungfuwingchun.com. So far on Kung Fu Los Angeles we have discussed Wing Chun hand techniques in several posts, but we have not spent much time exploring our devastating kicking techniques. Before we start, check out Wing Chun Techniques, Concepts and Theory (Focus on Centerline Theory) if you are new to Wing Chun or need a refresher on our centerline theory. This post explains why we do not use some of the more acrobatic kicks in the martial arts world (e.g. spinning back kicks) in the Wing Chun Kung Fu system. 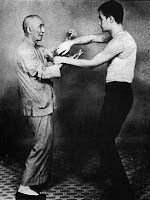 1) WING CHUN KICKS ARE EFFECTIVE: Many falsely assume that Wing Chun is limited in its use of kicks. Not true. Rather, Wing Chun limits which kicks it uses - only using those that are most effective and discarding the rest: "Wing Chun never uses high kicks to the head or big spinning kicks because they will leave you open to attack. The centerline of your body must always be covered so it is never vulnerable." 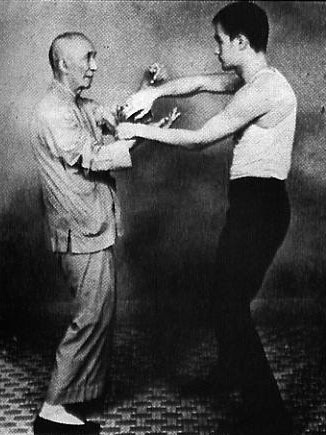 2) USE HANDS AND FEET SIMULTANEOUSLY: Wing Chun kicks are often used in combination with a hand technique - "When you are striking with a punch high to the face, and low with a kick to the opponent's knee, this makes your attack very difficult to block and overcome." 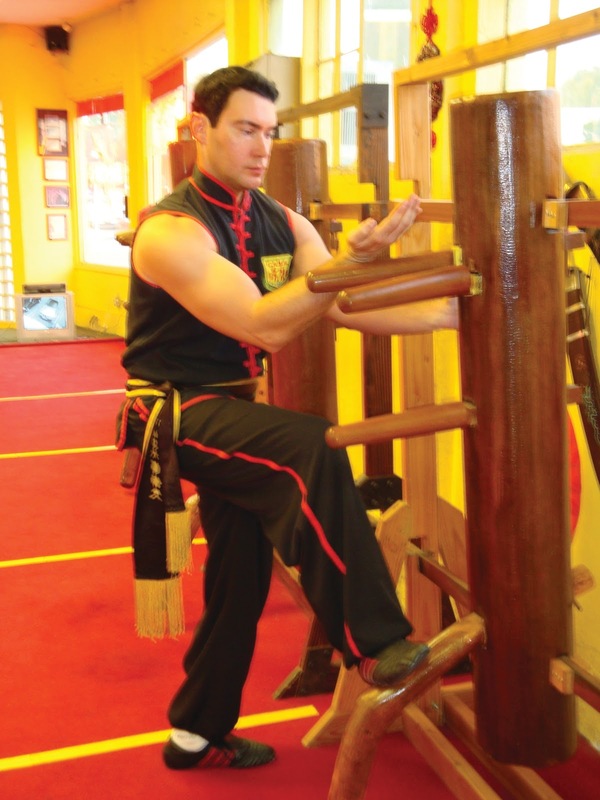 3) TARGETING YOUR KICKS: "When you use kicks in Wing Chun, focus them to hit certain areas... it is very important to kick the opponent in vital and hard-to-block areas such as the groin, knees, behind the knees, the shins, hip, or stomach." 4) SIMULTANEOUS ATTACK AND DEFENSE: Wing Chun kicks can be used both for attacking and deflecting your opponent's kicks*. For example, the side kick can be used in a downward motion to stop your opponent's kick, or to strike your opponent's knee. In future posts we will explore each kick's applications more thoroughly. In the meanwhile, thanks for reading and always feel welcome to stop by our school if you are interested in training! 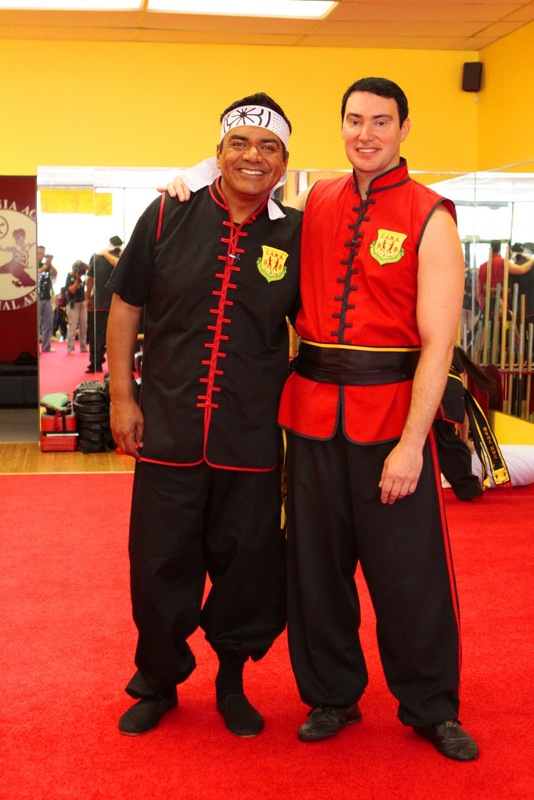 We welcome new students to come try the class with an appointment - just call us at 818-843-7916 or e-mail us at info@kungfuwingchun.com. 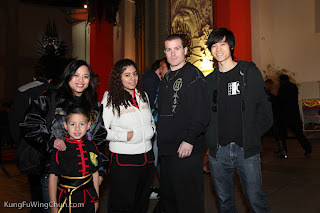 Kung Fu Los Angeles on Telemundo TV! 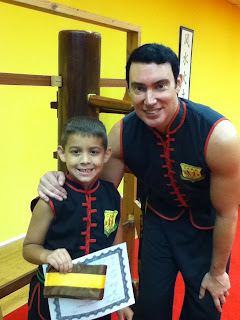 In 2009 our school California Academy of Martial Arts was featured on Telemundo's "En Contexto" with Ruben Luengas. The episode was filmed after a number of crimes against women in the Los Angeles area. Sifu Todd Shawn Tei, our Chief Instructor, and Mr. Luengas, a very prolific reporter in the Spanish-speaking community, discuss both the physical and mental aspects of Chinese martial arts training for men, women and children. California Academy of Martial Arts offers self-defense training for women all year round as part of its Wing Chun and Shaolin programs. Programs are available for students of all ages. For more information visit http://www.kungfuwingchun.com/. Wing Chun Training for Women... in Midair! You might have caught this gem on the news recently: Hong Kong Airlines is training its crew in Wing Chun Kung Fu for use against unruly passengers! Spokeswomen for the airline report that a female flight attendant has already used her Wing Chun techniques to subdue a "difficult male passenger" on a flight from Beijing, China. 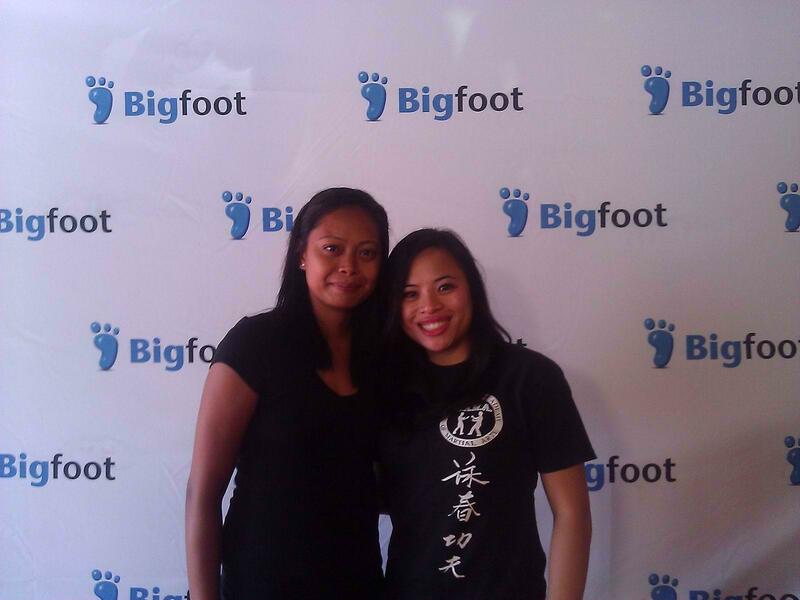 Why Wing Chun when choosing self-defense for women? 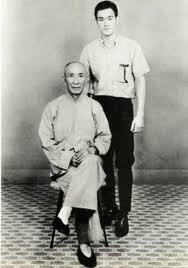 Well, don't forget... Wing Chun was created by a woman, the Shaolin nun Ng Mui, and named after its first formal student, the young girl Yim Wing Chun. The Guardian article also notes that Wing Chun is perfect for flight attendants/cabin crew because it "employs short, swift movements and can be practised in a confined space." 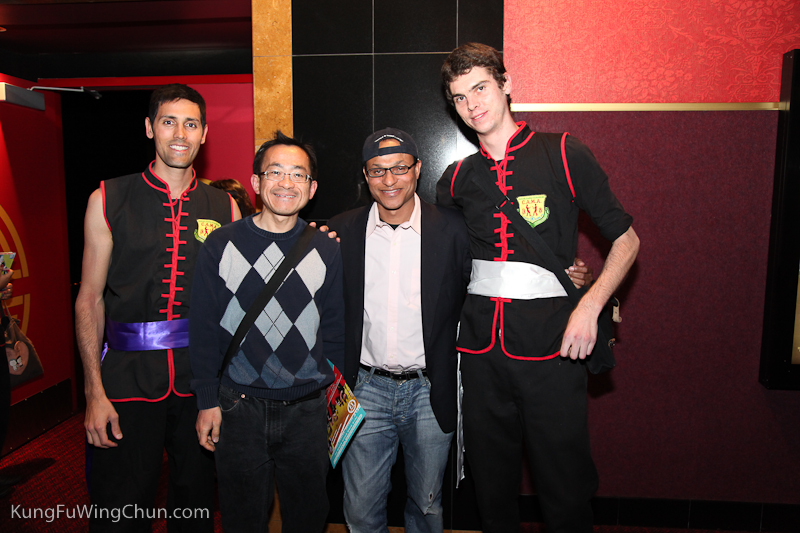 Shaolin Kung Fu is alive and well in the entertainment capital of the world! 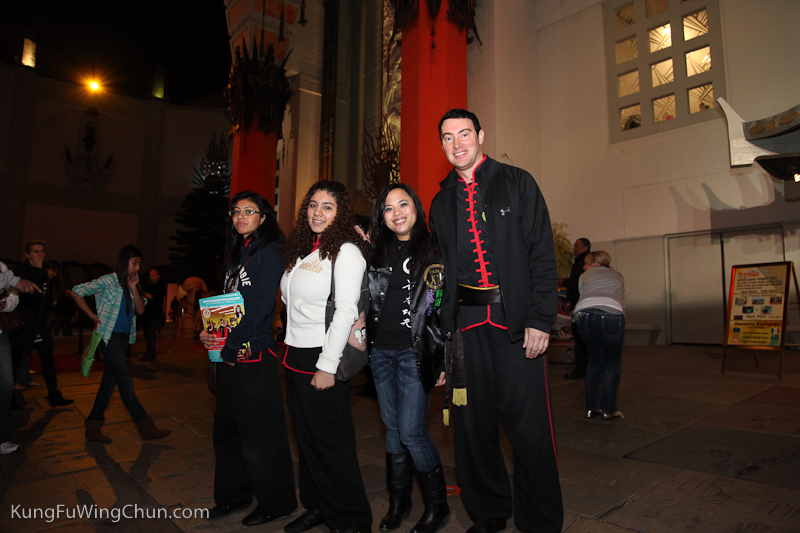 Our Kung Fu Los Angeles Shaolin Demo Team (all adults and teens) will do their second demonstration at the Laemmle's Sunset 5 Theater at 8000 W. Sunset Blvd in Hollywood tonight. The show time is 7:20, but our team will be on around 7:00 pm, so get there early to see awesome forms and fight scenes inspired by the movie. The movie stars Donnie Yen (Ip Man, Iron Monkey, etc.) and is on a limited theatrical run here in the United States. We'll try to get some photos and video up soon! Just a few hours ago, a 6 year-old boy tried our class for the first time. 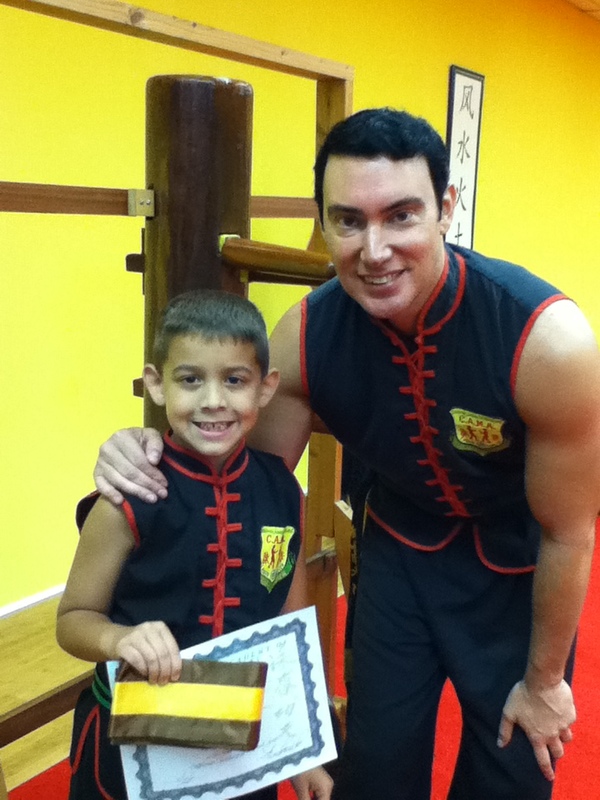 After the class, his mother said to one of our instructors, "I really like that you teach how to use the moves. He just tried a class at another school yesterday and they didn't show the kids how to use the moves at all. Just had them in the mirror kicking and punching." Here at California Academy of Martial Arts (Wing Chun Los Angeles/Kung Fu Los Angeles) we believe it's important for all students to know the applications of movements, deflections, and strikes. This may seem obvious - why on earth would one learn how to do a move but not learn how to actually use it for self-defense? Sadly, many schools, especially competition-focused schools, neglect teaching applications. 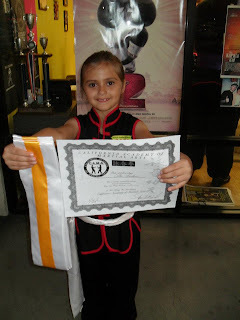 Meanwhile, ALL of our students, even our Little Pandas (ages 3-5), learn how to use basic hand and kicking techniques during their kung fu classes! This Saturday, April 9th, our Demo Team (both kids and adults) will be at Valley View Elementary School in Los Angeles (Studio City/Hollywood area) to support their spring festival. Our demonstration starts at 1:30 pm sharp, so if you're in the area, come watch us! There will be food, games and raffles throughout the day. 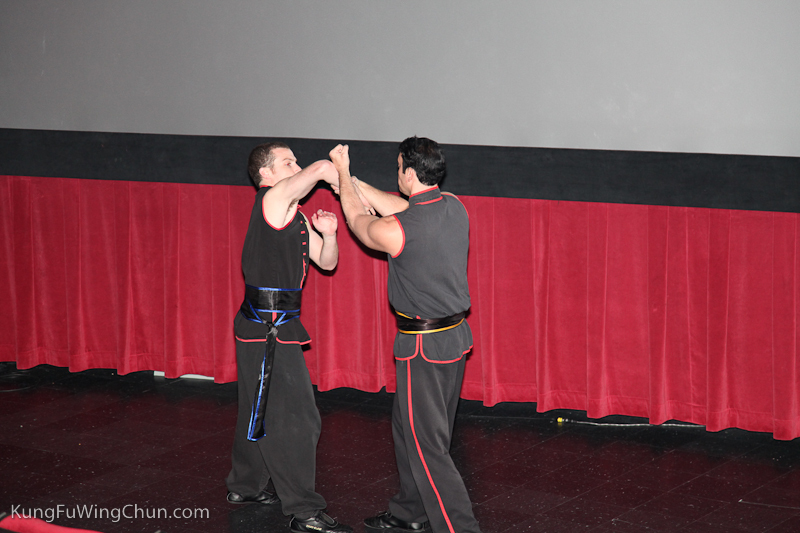 We also donated one of our "Kung Fu Power Packs" to their auction. 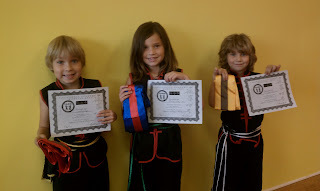 The pack includes certificates for group and private lessons, a T-shirt, etc. Other items available include gift cards, signed movie memorabilia, and jewelry. You can check out the items here. Several of our students including Catherine Glandon attend Valley View. At least two or three times per week, someone wanders in and says, "I'm here because I saw the movie Ip Man and I want to learn Wing Chun." 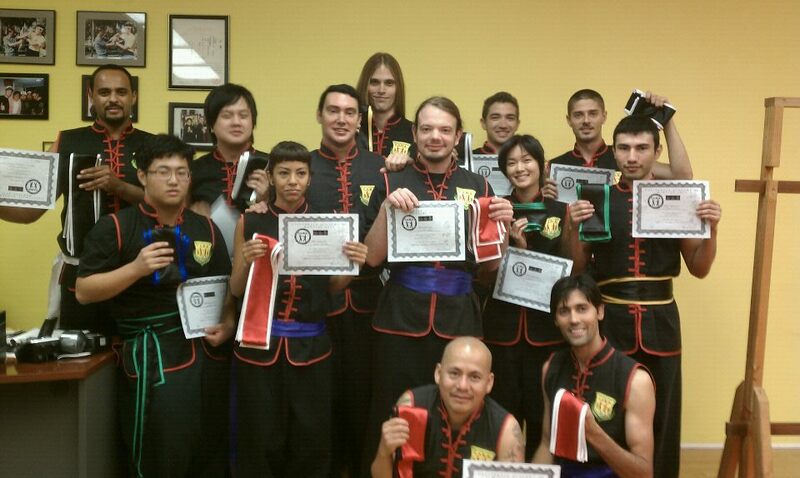 Many of these Ip Man enthusiasts have become some of our most dedicated students. 1. Ip Man 2 (2010) - sequel to Ip Man (2008); stars Donnie Yen and Sammo Hung. 2. Ip Man: The Legend is Born (2010) - prequel to the previous 2 Ip Man movies, starring Dennis To and Sammo Hung. 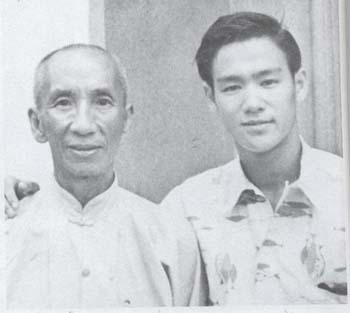 Features a substantial cameo by Ip Man's real-life eldest son, Ip Chun, who portrays Leung Bik (Ip Man's second Sifu). Made by a different production company than its predecessor. 3. The Grandmasters (2011) - stars Tony Leung and Zhang Ziyi. Was produced completely separately from the other 3 movies. The teaser trailer doesn't offer much unless you read Chinese, but we have high hopes for this film due to the caliber of its cast and its director, the renowned auteur Wong Kar Wai as well as action choreographer Yuen Woo-Ping. Bryan Mahoney of The 818 Now, one of our local news and opinion websites, recently visited the school. He spent some time speaking with C.A.M.A. parents and instructors and even did a quick "intro" (introductory lesson) with Instructor Paul K. Daniel. Check out the link which has photos and video! Check out video from our kung fu demonstration for the Burbank Boy Scouts Venture Crew 201 on Feb 3, 2011. What is mindfulness, and how does it apply to Chinese martial arts? Mindfulness means different things to different people. To most English-speaking Americans, to be mindful means to be cautious, aware, and attentive. For example, when I tell a young student "mind your stance" I am asking them to pay extra attention to their posture and stance movement. To Buddhists, the term "mindfulness" has extra meaning. It is considered essential to enlightenment (the ultimate goal of Buddhism, similar in importance to the Christian heaven). Right mindfulness requires the Buddhist focus continuously and deliberately on one's body, actions, and mind. It enables and empowers Buddhists to do the right thing and make the right choices. Mindlessness is everywhere in modern society. Sure, sometimes the mind needs a break, such as over that first cup of coffee in the morning or thirty minutes before bed. However, there are times when mindfulness is probably preferable. For example, who couldn't afford to be a little more mindful about what and how much they eat? Or when driving in rush-hour traffic? Mindfulness is everything in kung fu, especially when doing our forms. We martial artists must mind our stance movements, our hand techniques, our posture, our breathing, and, during performances, even our facial expressions! Just as regular exercise offers benefits beyond physical fitness (release of endorphins, self-esteem boost, long-term protection against various ailments, etc. 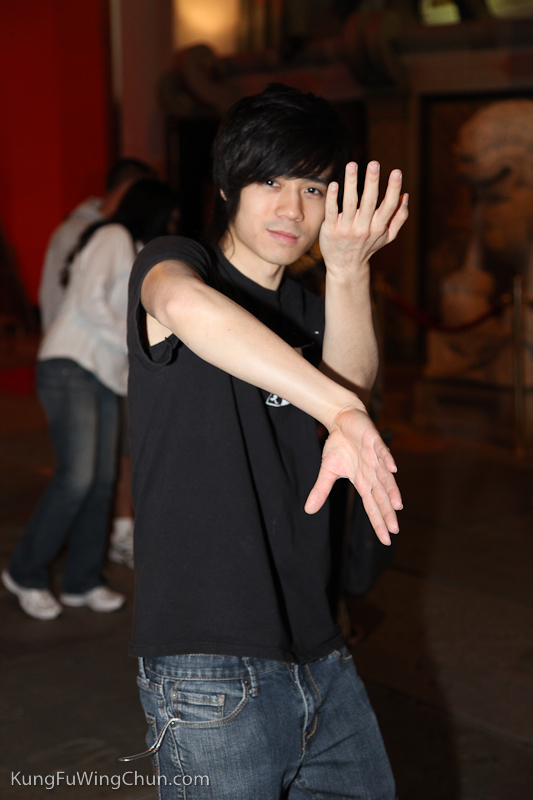 ), practicing kung fu forms offers benefits beyond simple memorization of a set of movements. Many parents believe their children are not victims of bullying and thus are caught unprepared when the problem hits home. 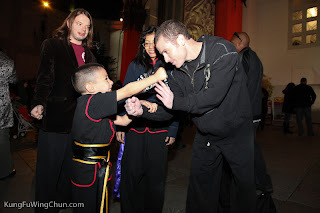 Of course, "bully-proofing" children is a large part of what we do at California Academy of Martial Arts. However, while the conversation on bullying tends to focus on victims and vilify the bullies themselves ("they're horrible kids! "), the reality is that the majority of them are good kids that just need some extra TLC. In fact, many are victims of bullying (or worse) themselves. Once upon a time, according to Disney's upcoming show "Jake and the Never Land Pirates," there was a lonely little boy who wanted to be invited to play with the other children. But he never was. And years later, when the boy became a man, he was better known as Captain Hook*. Isn't that message just as important as any other about anti-bullying? 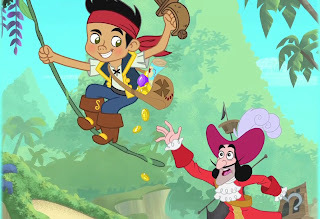 Successful anti-bullying programs (like ours) should incorporate the social lessons promised in 'Jake and the Never Land Pirates' so that our children learn that for bullying to cease in their communities they must not only cease to be victims but also cease to be bullies themselves. (*Excerpt from LA Times article published February 13, 2011. From Saturday January 29th, 2011 at Mann Grauman's Chinese Theatre in Hollywood, CA ahead of a screening of IP MAN 2 starring Donnie Yen and Sammo Hung. On Thursday a team of Tigers, Dragons and three instructors did two demonstrations at Yahoo.com's Burbank compound. Video and photos are on the way - we're editing together the best shots from multiple parents. In between shows, the kids were invited to partake in activities such as Chinese Lantern making, a raffle, and some delicious Chinese appetizers. They also played cards, explored the game room, and practiced forms. 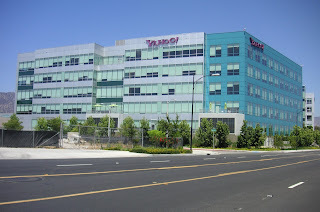 The Yahoo employees were so impressed and many congratulated our kids on their poise and performance. 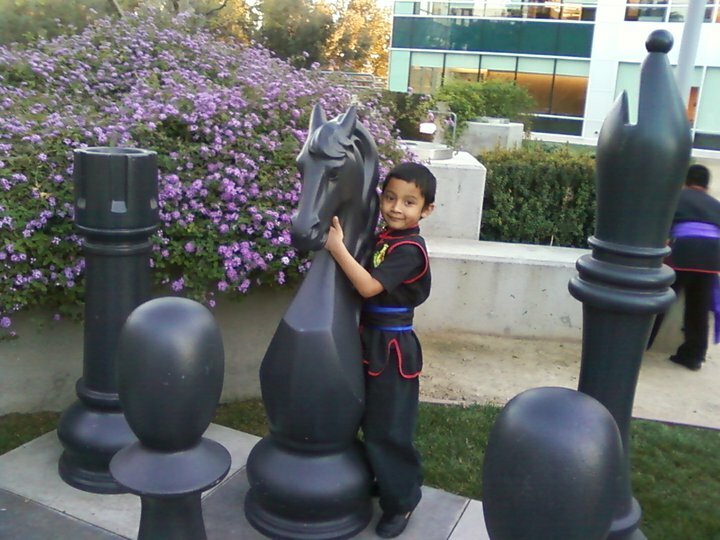 Valley View Elementary School Student is Studio City Whiz Kid! One of our Advanced Tigers, Catherine, was recently named a 'Whiz Kid' by StudioCityPatch, a local news website. She definitely is a Whiz Kid and we're very proud of her! Here's the link to the article about her recent accomplishment: Catherine Glandon Passes the Test! Where's the "Kung Fu" in Kung Fu Panda? 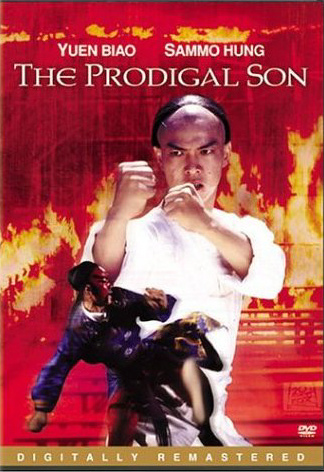 Every generation seems to have its classic martial arts movie that inspires children to take up the ancient arts. The 2000s has at least two: "Karate Kid" and "Kung Fu Panda". Kung Fu Panda came out first and was really a pleasant surprise. Animators consulted martial artists when animating fight scenes. They used some of the same animals that the Shaolin monks observed when creating martial arts: the crane, the snake, the mantis, the tiger, and the monkey. 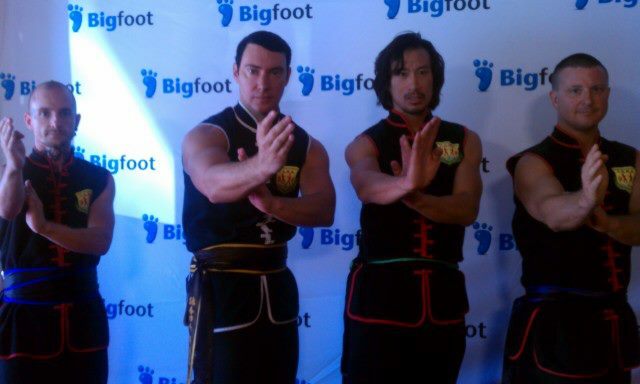 They used real kung fu hand techniques and kicks, too. Obviously their attention to detail really paid off, as Kung Fu Panda was a blockbuster hit and its sequel, Kung Fu Panda 2, is due out in May. So Miss Patty, one of our senior sashes and an assistant instructor, started with us when she was 8. For some reason, no one believes us when we say that -- which I think is a testament to how truly rare commitment is among our children today. So I'm posting PHOTOGRAPHIC EVIDENCE! Patty at about age 8 or 9 at the old school. As evidenced by her green sash she'd already been training for around 9 months. Patty at age 14, receiving her red & black sash! Today two of our Tigers, Keilee and Kaden, graduated to Dragons. Both have spent 6+ months in the Tigers program and have really gotten to know and befriend their classmates, so I knew that this would be a bittersweet moment for both of them. I asked Keilee, "Are you excited to go to Dragons?" She nodded yes. I said, "Are you sad, too?" She nodded yes and became teary-eyed. "I'll miss my friends," she said. We've all been through these moments in life, graduating from elementary school to junior high, junior high to high school, high school to (for many of us) college, etc. etc. We've changed jobs, moved cities... the list goes on and on. Meaningful change is rarely easy! The demo show last night for Boy Scouts Venture Crew 201 was amazing! 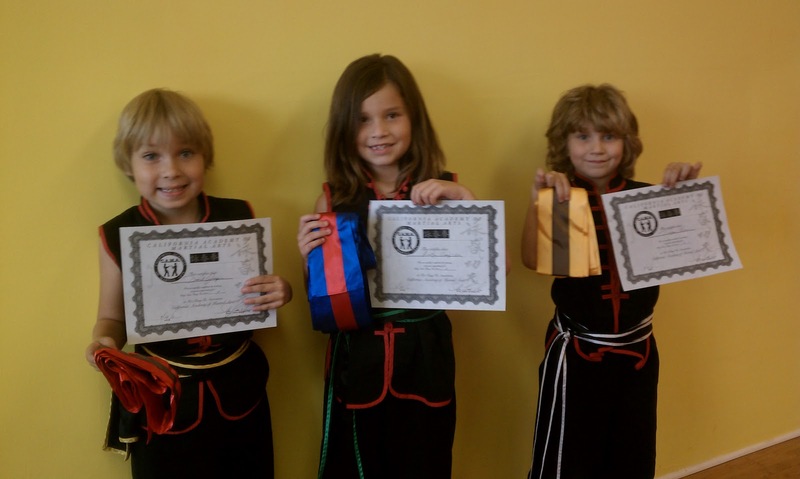 Our Dragon team (Gabe, Adam, Sydnee & Brian) performed Siu Lim Tao, Ping Kuen, a form from Crane, and Chinese Choy Li Fut broadsword. Miss Patty and Miss Gabby performed hand techniques and sparring. 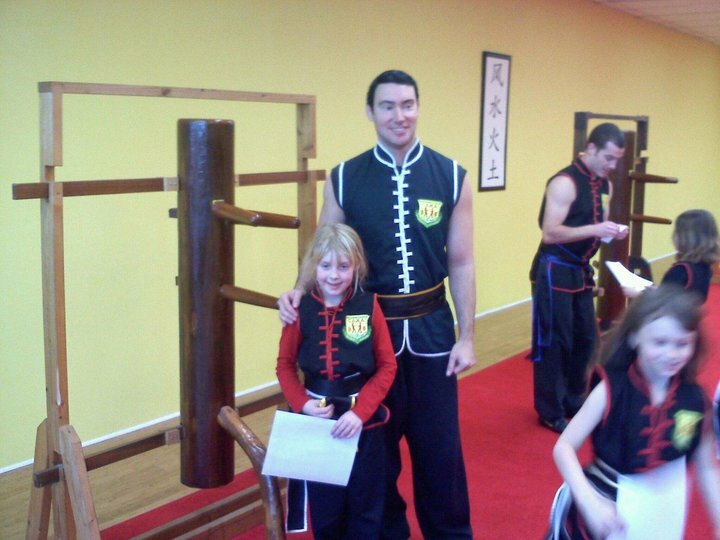 Miss Patty performed the Choy Li Fut pole and also some blindfolded chi sau with myself (Sifu Nancy). 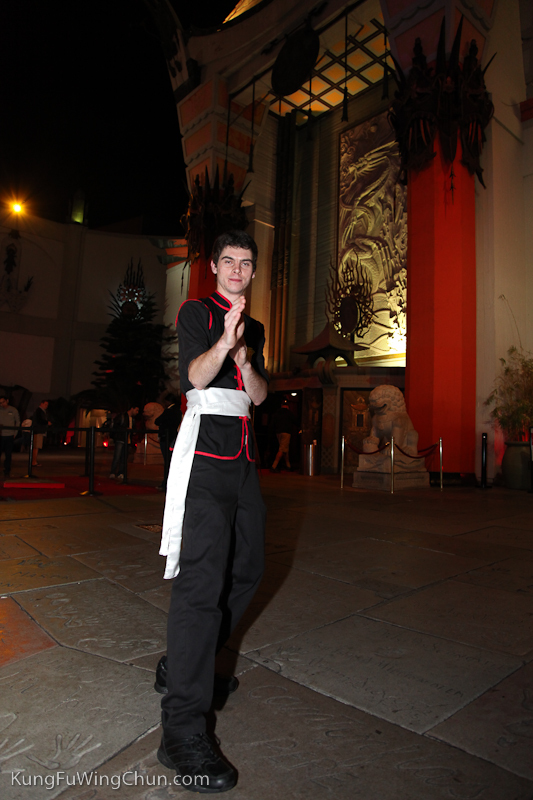 Afterward, the event's organizers generously offered for our team to partake in the Chinese dinner. Most of the kids and a couple parents accepted and feasted on orange chicken, chow mein, rice, salad, Mongolian beef, soup, tea, punch, etc. etc. Needless to say this was VERY generous of them and the team had a lot of fun celebrating the successful performance together and chowing down :) The Boy Scouts who were our "waiters" for the evening were very attentive! Send us your photos & video if you were there, please! Tonight four of our distinguished DRAGONS (ages 8-13) will be performing at a Chinese New Year-themed fundraiser held by the Boy Scouts Venture Crew 201. The event will be at: 2828 W. Magnolia Blvd. Burbank, CA 91505 inside a Methodist Church. It starts at 6 pm and will feature Chinese food and activities, plus a bunny petting zoo provided by Peggy Woods' Pet Emporium! Our kids are on at 7 pm and a few of our teens/adults will also give free sparring, weapons and chi sau demonstrations. "Reservations can be made by calling the Church office at (818) 846-2866 -or- through the church email at MagnoliaParkUMC@SBCglobal.Net Leave your email or phone number. In the subject line put, CHINESE NEW YEAR. Event Coordinator Larae Hanks will contact you to confirm your requests." 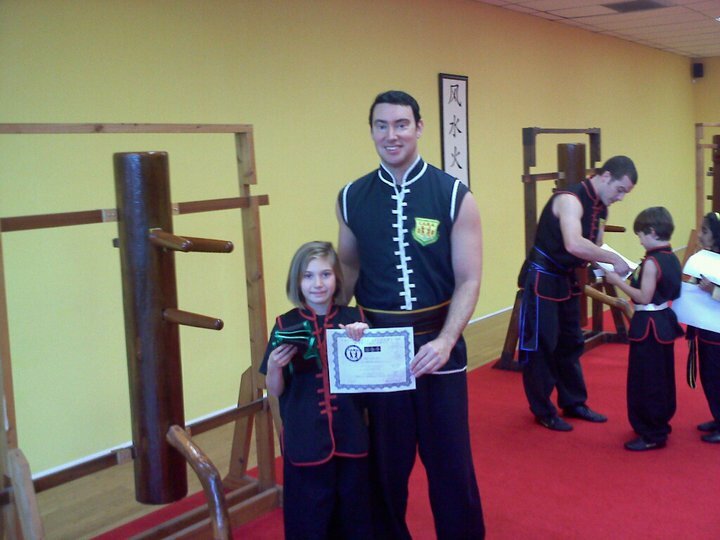 Sifu Tei on SPIKE TV's "1000 Ways to Die"
Last night Sifu Tei awarded new sashes to a number of our students who tested over this past week and weekend. Congratulations to all of them, because all of them -- the youngest being age 3 and the oldest in their 40s or 50s this time around -- earned their new ranking through hard work, humility and determination. Some of them have only been with us for a few months and took their first tests on Saturday, but one of them, Miss Patty, has been with us for 6 years! Her commitment is definitely something to be admired. Keep an eye out for a longer blog about her martial arts journey soon.